‘Iolani Palace was the official residence of both King Kalākaua and Queen Lili‘uokalani. It is actually the 2nd palace for Hawaiian Royalty. The first palace was known as Hale Ali‘i (House of the Chief). Kamehameha V changed its name to ‘Iolani Palace in honor of his late brother and predecessor. Although the old palace was demolished in 1874, the name ‘Iolani Palace was retained for the building that stands today. The cornerstone for ‘Iolani Palace was laid on December 31, 1879 with full Masonic rites. Construction was completed in 1882; in December of that year King Kalakaua and Queen Kapi‘olani took up residence in their new home. The first floor consists of the public reception areas – the Grand Hall, State Dining Room, Blue Room and the Throne Room. The second floor consists of the private suites – the King’s and Queen’s suites, Music Room, King’s Library, and the Imprisonment Room, where Queen Lili‘uokalani was held under house arrest for eight months in 1895, following a counter-revolution by royalists seeking to restore the Queen to power after the overthrow of 1893. The Palace area was originally enclosed by an eight-foot high coral block wall with wooden gates. Following the Wilcox Rebellion in 1889, it was lowered to 3’6″. In 1891, it was topped with the present painted iron fence. The Sacred Mound (previously a stone mausoleum) – Pohukaina – was constructed in 1825 to house the remains of Kamehameha II (Liholiho) and his consort, Queen Kamamalu. Both had died of measles while on a journey to England the year before. In 1865, the remains of 21 Ali‘i were removed from this site and transferred in a torchlight procession at night to Mauna ‘Ala, a new Royal Mausoleum in Nu‘uanu Valley. 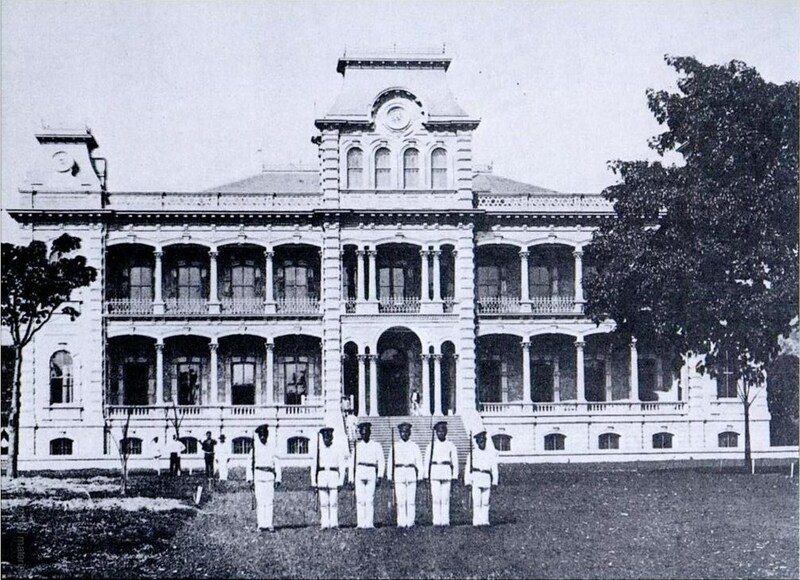 Halekoa – ‘Iolani Barracks – was completed in 1871 to house the Royal Guard. This coral block structure contains an open courtyard surrounded by rooms once used by the guards as a mess hall, kitchen, dispensary, berth room and lockup. Kanaʻina Building – Old Archives – was built in 1906 and was the first building in the US erected solely for the custody and preservation of public archive materials. ʻIolani Palace was outfitted with the most up-to-date amenities, including indoor plumbing with hot and cold running water. The King also installed a modern communications system that included the recently invented telephone. Gas chandeliers installed when the Palace was first built were replaced by electric lighting five years later (less than seven years after Edison invented the first practical incandescent bulb, and, four years before the White House). After the overthrow of the monarchy, `Iolani Palace became the government headquarters for the Provisional Government, Republic, Territory, and State of Hawai‘i. The palace was used for nearly three-quarters of a century as a government capitol building. During WWII, it served as the temporary headquarters for the military governor in charge of martial law in the Hawaiian Islands. Government offices vacated the Palace in 1969 and moved to the newly constructed capitol building on land adjacent to the Palace grounds. ‘Iolani Palace is owned by the State through DLNR. While Director of DLNR, I had several opportunities to visit and tour the property. Through a lease agreement with the State, the Friends of ʻIolani Palace supports, guides and manages Palace activities, including public guided tours. The image shows ‘Iolani Palace in 1882, shortly after it was completed.